LAKELAND, Fla. (AP) When Michael Fulmer arrived in the major leagues in 2016, his impact was impressive and immediate. Now, the Detroit right-hander will settle for steady progress. Three years after that sparkling debut season, Fulmer is at a bit of a crossroads. He won AL Rookie of the Year honors in 2016 but has struggled to return to that form, especially last year, when he went 3-12 with a 4.69 ERA. His 2018 season ended a bit early because of knee problems, and Fulmer - who turns 26 this month - has been working on some mechanical adjustments in response to his injuries. "I think last year, performance-wise, I wasn't a hundred percent all the way through the season, and I think it showed," he said Monday. "This year, we're trying to kind of redo everything and get to be pain free, which I am. I'm blessed for that, and I think everything else will kind of build up." 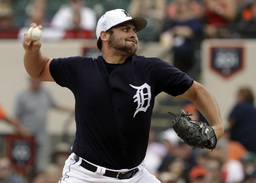 Fulmer pitched three innings in Monday's 9-5 victory over the St. Louis Cardinals. Kolten Wong led off with a home run that carried up to an elevated walkway behind the bullpen in right field. That was the only run off Fulmer. "He felt really good with the ball coming out of his hand," manager Ron Gardenhire said. "The second and third inning, really good. It was coming out nice, his changeup, his breaking ball, so that's what you're looking for. Now, whether the velocity gets going with it, who knows?" Fulmer's velocity has been a big topic. The pitch Wong hit for a home run was just 91 mph, according to the reading at the ballpark. But Fulmer figures he has enough time to build up to higher speeds as the season approaches. "I'm not worried about it," he said. "If it keeps going up every outing, then we'll be spot on." The Tigers acquired Fulmer in 2015 when they traded Yoenis Cespedes to the New York Mets. Shortly after Fulmer arrived in the majors in 2016, he went on a run of nine straight starts allowing no more than one earned run. That peak would have been hard for any pitcher to sustain, but Fulmer finished with an 11-7 record and a 3.06 ERA, beating Gary Sanchez of the Yankees for Rookie of the Year. He was 10-12 with a 3.83 ERA in 2017, earning an All-Star nod, but last season raised questions about both his health and his ability to pitch like an ace over the long term. Right now, Fulmer has a lot to prove. His health seems fine. His fastball is a work in progress. Both will be under scrutiny over the next few weeks. "He's the only person that knows if he's going to have a little extra, and we just have to give it time," Gardenhire said. "This is spring training, so he's got plenty of time. He's going to have quite a few more starts." NOTES: The Tigers have all 40-man roster players under contract for 2019 after announcing deals right-handers Victor Alcantara, Sandy Baez, Buck Farmer, Reed Garrett, Eduardo Jimenez, Joe Jimenez, Franklin Perez, Zac Reininger, Spencer Turnbull and Drew VerHagen; left-handers Ryan Carpenter, Jose Fernandez, Matt Hall, Gregory Soto and Daniel Stumpf; catchers Grayson Greiner and John Hicks; infielders Sergio Alcantara, Jeimer Candelario, Willi Castro, Brandon Dixon, Niko Goodrum, Dawel Lugo and Ronny Rodriguez; and outfielders JaCoby Jones, Mikie Mahtook, Dustin Peterson, Victor Reyes and Christin Stewart.